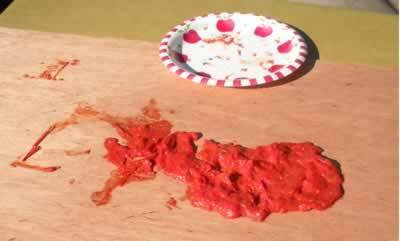 Tomato paste brings a nice reminder of summer into one’s kitchen in cold weather. But the canned tomato paste from the grocery store can be problematic in our house: we never seem to use an entire can. Inevitably, half of it goes moldy and must be discarded. Having already put up tomato sauce this month, I wanted to try my hand at estratto do pomodoro, sun-dried tomato paste. Instead of Lanza’s huge batches of tomatoes and a giant cast iron cauldron, I started small, with about 2 pounds of tomatoes from my garden. Amish paste tomatoes in foreground are deceptively large. I cut the tomatoes in half. Using my thumb, I removed the soft watery parts with the seeds. The halves went into a pot with a tablespoon of olive oil and a teaspoon of salt. In retrospect, I should have reduced the salt; a quarter teaspoon would have sufficed. The tomatoes simmered under a low flame for an hour. 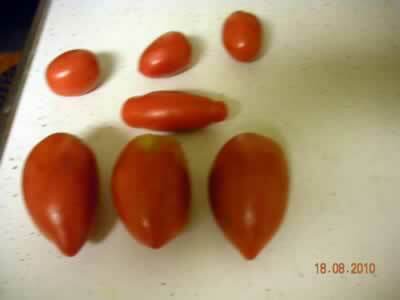 tomatoes had evaporated to a quarter cup or a bit less. Given the minimal quantity, I opted not to set it out for another day (Lanza spent eight or nine days in this part of the process.) But what to do with the tomato skins that remained in my paste? I didn’t have nearly enough raw material for a food mill to be practical. 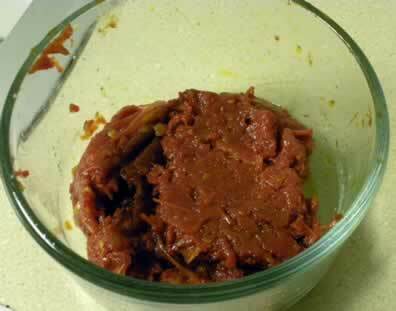 I pulsed the paste in a food processor several times until the tomato skins were incorporated. While the consistency isn’t perfect, this was a satisfactory first effort. This entry was posted in Cooking, Italian, Recipes and tagged olive oil, salt, tomatoes. Bookmark the permalink.